In Part 1 of this series on organizing your kitchen, I offered 10 steps to organizing your kitchen cabinets, putting the focus on everyday dishes and glassware, barware, and vases and pitchers. 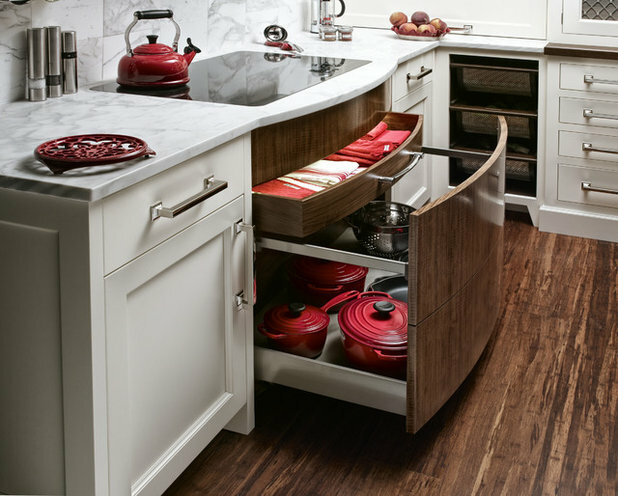 If you followed at least the first seven of those steps, your cabinets are now so organized, it makes you happy every time you open their doors. 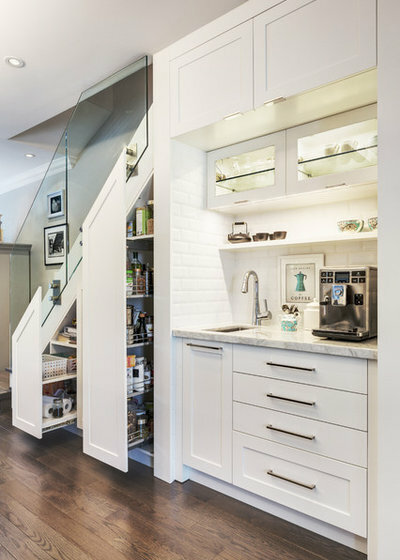 Those same steps can be applied to organizing your more specialized kitchen storage areas. 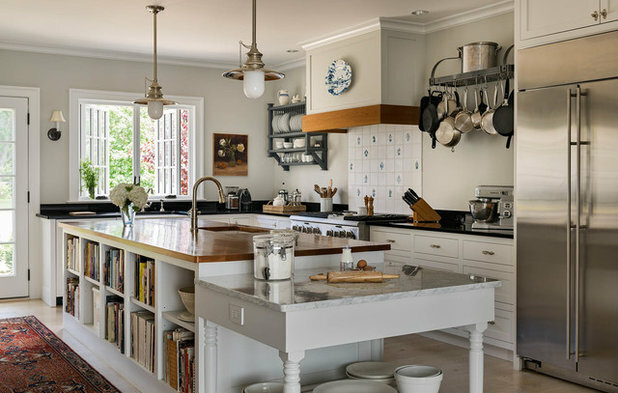 Read on for tips on organizing your pots and pans; your coffee, tea and baking supplies; your spices and oils; your cleaning supplies and your gadget-charging stations. In Part 1, I wrote about storing your everyday china and glassware close to the dishwasher to make it easier put it all away as you unload. 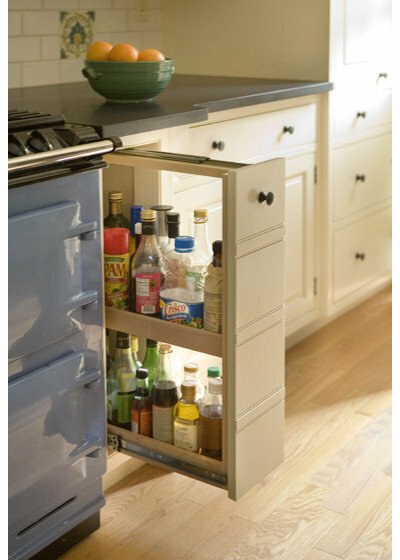 You can apply that same idea to other kitchen storage areas. What do I need first thing in the morning? What do I need close at hand when cooking at the range? Are all my baking needs close to where I roll out dough and mix batter? Where are all my cookbooks and recipes? Are my mobile phones and tablets cluttering up my counters when I charge them? Are my kitchen cleaning supplies close at hand when I need them? 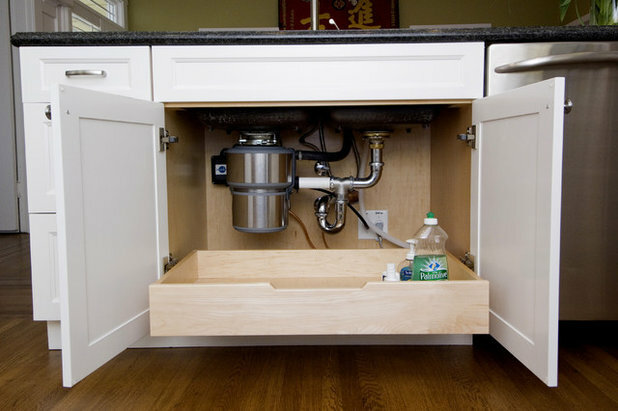 Ugh — what’s under my kitchen sink, and why is it there? Can I even recall what’s stashed way in the back behind the sink pipes? To make it easy to get your caffeinated drinks brewing when you’re still bleary-eyed in the morning, set up a coffee and tea station. Put your coffee beans, tea bags, filters, bean grinder, sweeteners and mugs in a cabinet over or under your coffeemaker or teakettle. If you wish, go a step further and keep your usual breakfast needs, such as hot and cold cereals and your smoothie maker, there too. 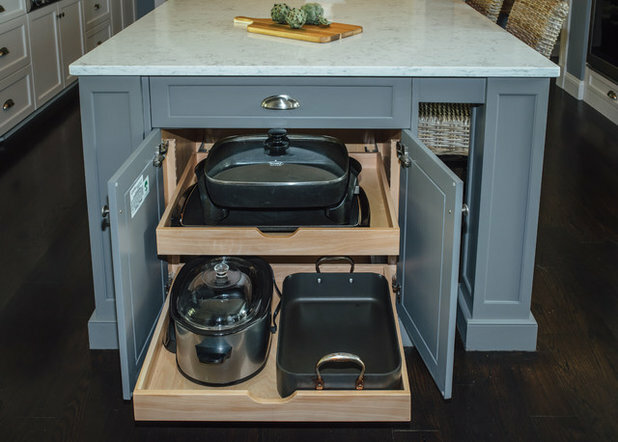 Today’s fancy kitchen cabinets have all kinds of pullouts and inserts for baking sheets, pots, pans and lids, making it easy to store and find your cookware. Here’s how to organize pots and pans for those of us with simple cabinet doors and shelves. Stack all the long, flat pieces, like baking sheets and cutting boards, along the side of the cabinet. Nest your pans from large to small in a stack and do the same for your pots. As for those pesky lids, put them all together in a cake pan, an extra strainer or a mixing bowl in the area behind your pot and pan nests. 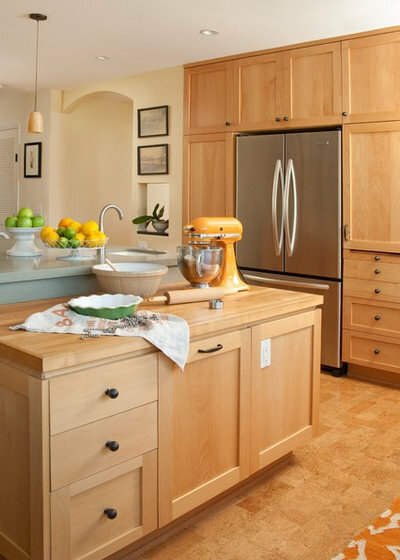 As you tackle these cabinets, you may find items like bread makers or panini makers, excess serveware or holiday items you may use once or twice a year. These things have not earned that valuable kitchen real estate. Pack them away in a closet, basement or garage or an attic. If you don’t love an item or honestly will never use it, put it in the donation box. Now, as author and organizational expert Emily Ley advises, if you’ve left any empty room in your cabinets, save it and let it breathe awhile. The right use will present itself eventually. It would be dreamy to have a pullout spice rack like this one next to the range. If you’re still dreaming of kitchen storage like this, you can organize your spices in stand-alone storage racks or drawer organizers. Take the oils, spices, salt, pepper and other seasonings you use at the stove on a regular basis and corral them in something as simple as a shoebox that’s easy to grab when you’re ready to channel your inner Julia Child. Stash it in a cabinet next to the range. If you’re not psyched about the shoebox, cover it in vinyl paper or let your kids decorate it for you (mine just says “herbs” in permanent marker; I’m not that crafty!). If you love to bake and want your supplies to be easy to find and use, create a station for your mixing bowls, spoons, sifters, ingredients, rolling pins and other baking supplies in a cabinet close to the surface where you roll out dough and use the mixer. Corral the usual baking ingredients into a box or canisters. If you have a set of pretty canisters that you like to look at, leave them on the counter close to your mixer and where you work on your baked goods. Remember that empty space that earlier I told you to save? If it’s near your baking area, use that space to keep your recipe library handy. 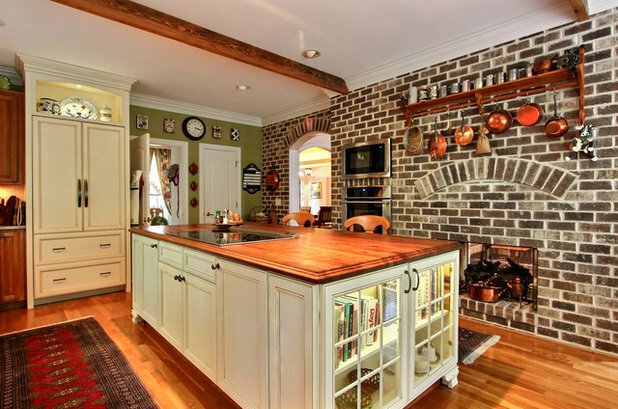 If you have an open shelf or a glass-front cabinet, cookbooks and recipe boxes are wonderful items to display there. 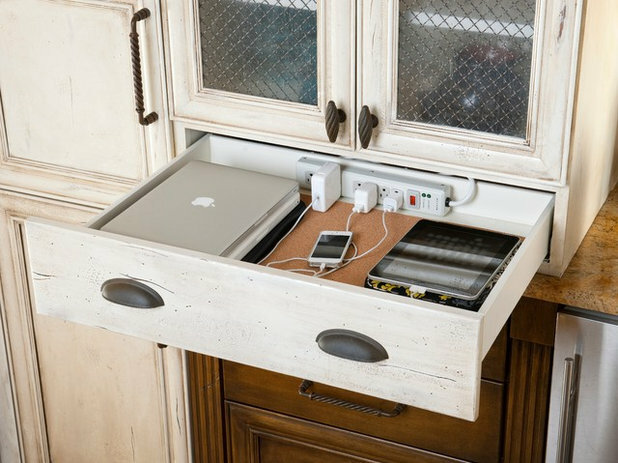 Phones, tablets and chargers aren’t necessarily cabinet clutterers, but they are kitchen counter clutterers. And having expensive electronics in a spot that could potentially get splattered by water or mashed potatoes is less than ideal. Many people are installing ventilated device drawers outfitted with an outlet for charging. 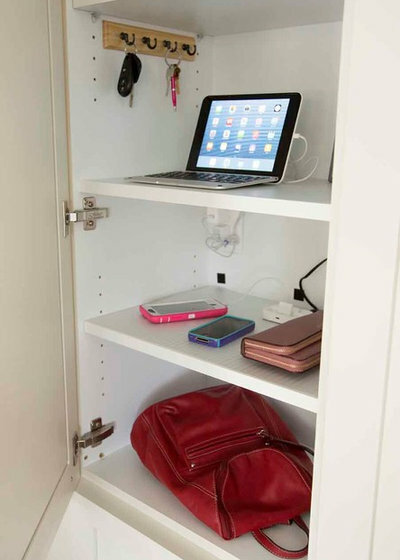 A cabinet in the kitchen, pantry or mudroom also can be a good home for portable electronic devices, as well as keys and small bags. Some plug-in chargers can service several devices through one outlet. If you have limited kitchen space for storing cleaning supplies, prioritize the supplies you use to clean your counters and sink. These should be close at hand in the kitchen, as this is the most important space to keep hygienic. While this photo shows a a nice pullout, you can get the same effect with a couple of waterproof bins. A caddy with a handle is a worthwhile investment: You won’t have to bend over far to grab the handle and bring your supplies where you want to use them. In the kitchen seen here, a caddy is built into the pullout hardware. And if you keep your supplies somewhere else, like in a mudroom, it’s easy to grab a caddy full of kitchen cleaning supplies and carry them into the kitchen all at once. Assess. Think about what really belongs down here: dish soap, sink drainers, hand soap refills, an extra scrubber sponge, steel wool, perhaps extra paper towels. Consider shelves. 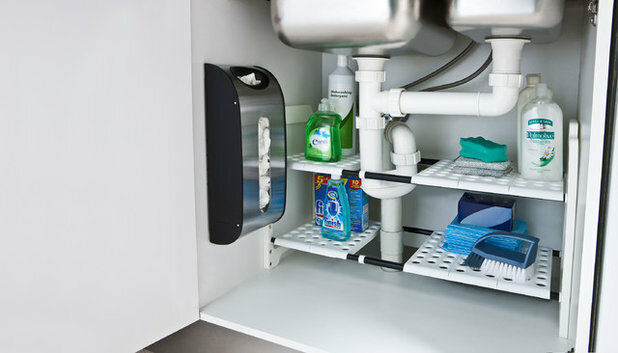 If you want some extra help, purchase an undersink shelf system like the one pictured here. If you reuse plastic bags, a grocery bag dispenser like the one seen here is a great idea. Organize and restock. The little stuff needs to be corralled, or you’ll never find that dish drainer when you need it. I used a square glass vase from the florist that was going to waste to contain the drainers, sponges and scrubber brush. Stack trash bag boxes to one side and neatly organize extra paper towels on the other. The back of the cabinet is for less-used items, like dish and hand soap refills. The front of the cabinet is for dish soap and dishwasher detergent so they’re easy to access. By now you are probably getting so good at paring down, you may even wind up with room for that kitchen cleaning supplies caddy. 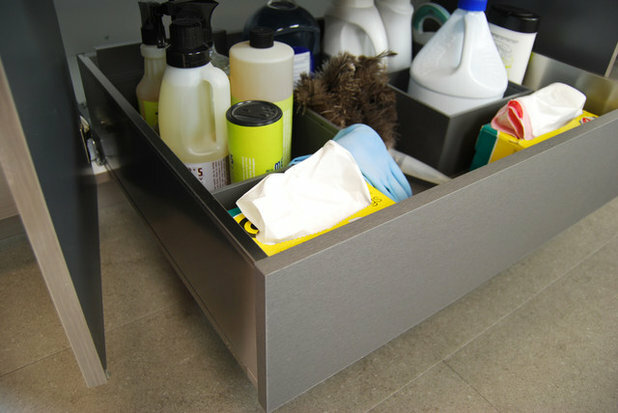 A full pullout drawer is another good solution for getting to the things that are stashed way in the back of your cabinet under the sink. 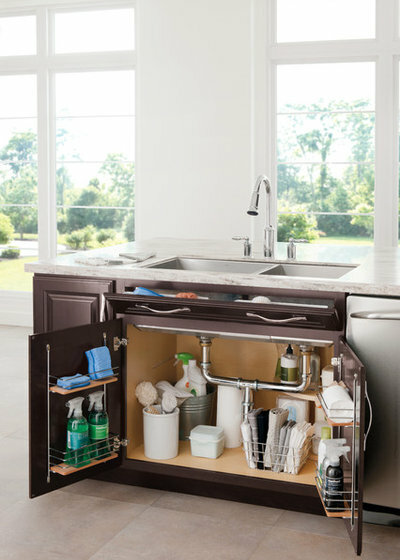 Share your kitchen storage success story: Have you set up any special stations that have eased your kitchen work? Please add to this story by sharing them in the Comments.